John Johnson and I will give a joint appearance at The French Press to talk about the PLAN 9 movie he directed and my novelization of it. Expect behind-the-scenes footage, a reading from the novel, and some interesting Q&A. 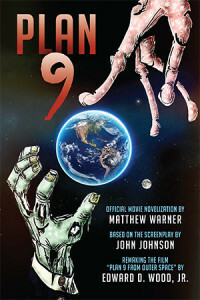 The long-awaited release of the PLAN 9 movie in physical media happens on Jan. 5, when Walmart will stock it in stores. When you get it, don’t forget to buy the novelization. On Nov. 14, I’ll be a guest of Rockbridge County High School in Lexington, VA, telling their third-period students about what it was like to write Plan 9: Official Movie Novelization. This is part of an ongoing series where visiting authors talk to students about the publishing industry. The first reviews of Plan 9: Official Movie Novelization are in, and they’re good ones. A book reviewer for Horror Talk who says she hasn’t yet seen the movie has this to say: “It entertains you even if you haven’t seen the movie it’s based on. … Not only did I enjoy the novelization, it’s whetted my cinema appetite and makes me want to watch both the original and the remake. I’d recommend Plan 9 as a light and fun read that you don’t have to take too seriously.” Click to read the whole 4-star review. And a Goodreads reviewer with a unique perspective into the film says, “Well written, well executed, the author very much captured the unique actors/actresses takes on the characters as well as giving them more depth.” Click to read his review. My kids’ school is auctioning off an autographed copy of Plan 9 until 5/6 as part of an annual fundraiser. The opening bid is just $5. SF Signal just published an interview with me, “Plan 9” Is Back! Matthew Warner Novelizes the Remake of the Notorious Zombie Movie. It goes into the process of novelizing the Plan 9 movie and putting together Dominoes in Time. Check it out! My local newspaper ran a nice profile piece in the Sunday edition. It covers lots of topics, including Dominoes in Time, Plan 9, and family life. My favorite lines are those about my kids. During Tony Tremblay’s recent trip to Virginia, I was fortunate to be a guest on his cable-access TV show, “Taco Society Presents.” It was a wide-ranging interview with Nanci Kalanta and Tony about my different books, writing process, and home life. Here’s the video, queued to begin at the start of my interview. Also be sure to watch Nanci Kalanta’s interview immediately before and Dave Simms’s interview afterward.